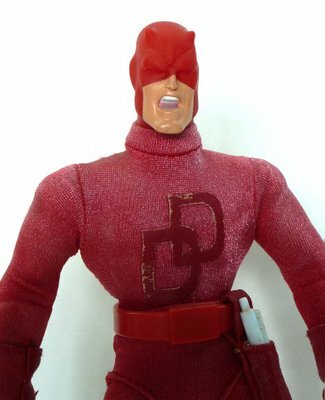 I guess it’s too late to warn everyone since you will have already seen this atrociously ugly Daredevil action figure by now. Really, what’s with the contorted face, the misplaced ears, the turtleneck sweater and the Jane Mansfield waist? He’s also wearing over-sized oven mitts and snow boots, as can clearly be seen in more pictures over HERE. Well, I did get a good laugh out of it at least. Yes, I do have one of these figures. It’s wrong on so many levels, but being the completist in having everything I can find related to DD, I got it off ebay. The hands under the kitchen mitts are awful. The scale is off, and the right hand is a lot larger than the left. Not to mention that backwards DD. Who signed off on this atrocity? You have to wonder. And congratulations to Francesco! Way to go! Seriously, you could choose a BW pic to accompany your congratulations! blimey – that’s a weird costume – perhaps it’s Matt’s arctic wear? Let me also extend my congratulations to Francesco too, whilst I’m here.